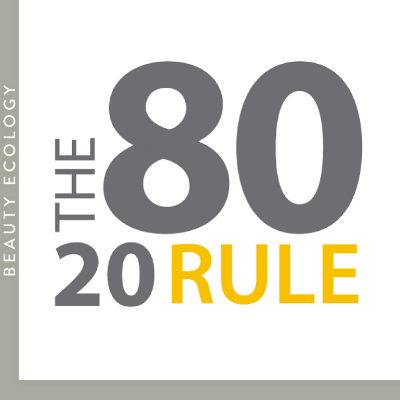 How the 80/20 Rule Affects your Genetics & Tips to a Everyday Glow. Hi there! Thanks for joining me as we continue to peel back the curtain and open up the conversation about everyday toxins. I’m deeply committed to giving you this information in a way that’s accessible, actionable, and free from overwhelm. We’ve all been there - Googling our symptoms and wanting to bury our heads in the sand, so we don’t have to keep reading about all of the “bad choices” we’re making. This type of overwhelm does nothing to promote change; it just makes us feel shame. No stress. Instead of getting paranoid or fanatical about toxins, let’s take a practical, judgement-free, and informative real-world approach. We're skimming for time-sake as we brief on your DNA, how toxins effect you (80% is a result of choices), and 3 quick tips on reversing toxicity - daily! I love the picture above. It's makes it easy to see that the outer world we live in makes a huge impact on our body, mind and health. We’re exposed to chemicals in our everyday lives that can undermine our health and beauty and cause some of the symptoms and conditions women live with like cancer, advanced aging, stubborn weight loss, allergies, insomnia, and on and on. FACT: Studies now confirm that the way we age is only 20% determined by genetics. FACT: The other 80% is determined by our environment and day-to-day choices and stressors. Toxins make up a significant part of that 80%, so understanding them can help us fight aging as well. I’ve worked with many health and wellness professionals and stay up to date on lifestyle influencers when it comes to the ins and outs of chemical toxins and their impact on women's health and hormones. I've found that chemicals are especially a critical component when it comes to the effect on our endocrine system and hormonal balance. As women age and menopause starts, weight gain is usually a stubborn subject and hard to "budge." Could chemical overload be contributing to the hopeless weight gain when you've tried everything? You'll never know until you start addressing the possible contributors in the flow of everyday decisions. Stop accelerating aging and increase the quality of your inner-outer beauty with quick and practical solutions. More likely, it is the daily habits we do (and not do) that create our best health. A 3-day cleanse probably can't makeup for a 300-day binge on oreos, so, here are a few ways that you can incorporate detox into your everyday life. Begin gently & Play rough. Start your day off with warm water and lemon a add roughage or fiber and lots of it to keep your digestive system moving. Create heat. Sweating out toxins that can build up in our liver and cells can be done in many ways: aerobic exercise where you build up a sweat, saunas, and a bath routine like this one all help. Brush it off. Think about dry brushing daily or a few times a week to help your circulation along (which helps the detoxification process). It helps create soft skin, too. Here's the technique. ***Stop by Beauty Ecology for our Top Shelf Detoxification Body Brush! STOPPING the hidden stressors that effect our BEAUTY BIOLOGY. .
Know where toxins live or reside in product purchases to stop them from getting in. Go deeper with phase 1 & 2 liver detoxification support naturally or with a health professional. Address the very culprits that are keeping you from your most optimal energy, glow and healthy mindset. You learn more HERE and you can grab your tickets HERE!